I'm almost done with the second sleeve of a cardigan, and I have snaps in mind for the closure. Wouldn't you know it, the Spring 2012 issue of knit.wear magazine featured an inspiring article about covering snaps with fabric before sewing them on. It's such a neat idea, and I love the little pop of color that will greet me when I'm taking off or putting on the sweater. And when I wear the cardigan open, those fabric colors will be so much cuter than an ugly metal snap. 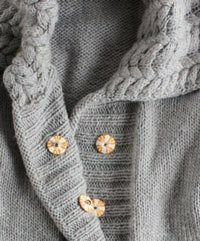 Fabric-covered metal snaps can refine the look of any piece that would normally use buttons and buttonholes. 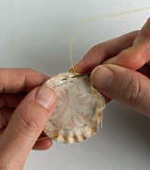 To use snaps instead of buttons, work any bands or other edge treatments as directed, omitting buttonholes. Covered snap closures will be hidden when a garment is closed and provide a flash of subtle interest when a garment hangs open. STEP 2 Make your patterns. 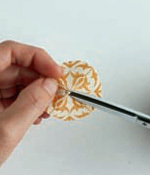 Trace around the edge of the snap on a piece of paper and then add 1⁄8" all around to make the interfacing pattern. 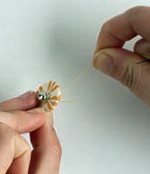 Draw a separate second circle, about twice the diameter of the snap, to make the fabric pattern. Creating patterns isn't strictly necessary but will make the process smoother when making several covered snaps at the same time. STEP 3 Cut and prepare fabric and interfacing. Trace around your paper patterns onto your fabric and interfacing and cut out with sharp fabric shears. For one snap pair, you will need two circles each of fabric and interfacing. Following the manufacturer's directions, fuse the interfacing to the center of the wrong side of each fabric circle. STEP 4 Using small, sharp scissors, cut a very small hole in the center of each interfaced fabric circle. The resulting opening should be slightly smaller than the snap peg to ensure a snug fit. STEP 5 Cover the snap. Using thread that matches the fabric, sew a running stitch around the edge of the fabric circle. 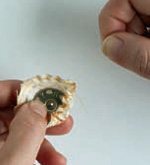 Place the snap halves on the wrong side of the fabric, aligning the holes in the fabric with the hole in the female side of the snap and with the peg on the male side. Pull the thread to gather the fabric, securing the snap within, and secure with several small backstitches. STEP 6 Finish your garment. Sew the snap halves to your garment with neat, even overcast stitches that pass through the holes in the snap and do not show on the right side of the knitting. Snaps can match the knitted garment, adding an elegant and minimal closure, or they can contrast, making a quirky style statement. Try a bold solid to highlight the occasional colored fleck in a tweed. Or try small plaids or tiny prints for a surprise element that cheers up an otherwise simple design. I can't wait to add fabric-covered snaps to my sweater! I'll post a photo on our Facebook page when I'm done. This is such a fun idea. Even if you're a beginning knitter, you can add these snaps and pump up the volume on the simplest cardigan sweater! Knit.wear magazine is full of these types of interesting ideas for making your knits shine, as well as fabulous patterns from amazing designers. We've put all of the digital issues together for you in a knit.wear kit. Get yours today! P.S. 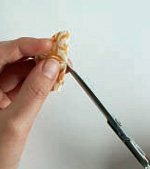 Have you used snaps on your knitwear? Share your tips in the comments!